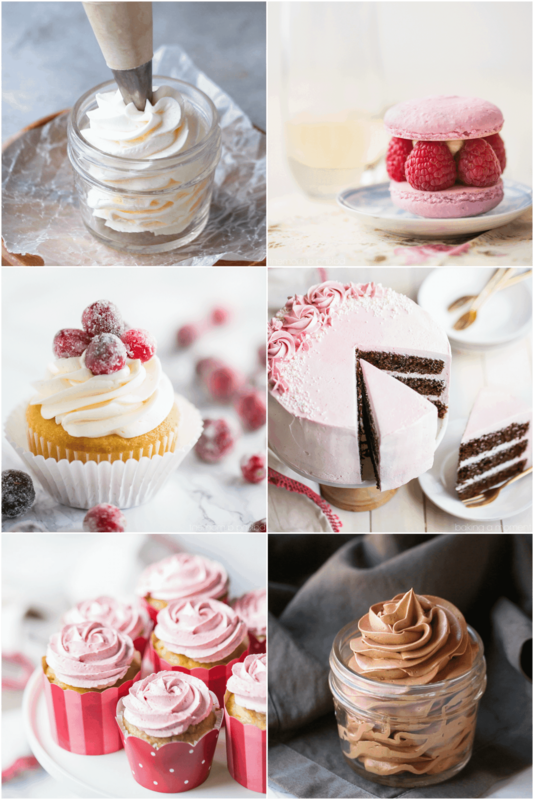 Find out everything you’ve ever wanted to know about Swiss meringue buttercream: from how it’s made and stored, to what to use it for, and how to flavor it in all sorts of ways. You’ll love this light, silky frosting so much, you’ll never go back to powdered sugar again! The light, silky texture and perfectly sweet flavor blew me away. I had never tasted anything quite so delicate before. Right away, I realized that this was the BEST way to take my cakes and cupcakes to the next level, and I have never looked back! There are so many recipes here on Baking a Moment that utilize Swiss Meringue Buttercream. I’ll share some examples below. But first, I’d like to take the opportunity to answer any and every question you’ve ever had about this unique and delicious frosting! What is Swiss Meringue Buttercream? Swiss meringue buttercream is a frosting that can be used for topping and filling cakes, cupcakes, and macarons. It’s incredibly light and airy, yet rich and buttery at the same time. The thing that I love most about it is its silky texture. Because its made by first dissolving sugar into egg whites, it has an incredibly smooth quality that you just don’t get with regular powdered sugar (aka: American-style) buttercreams. When you take a taste, you’ll be struck by its subtle sweetness, and the way it just melts on your tongue. Is it hard to make Swiss Meringue Buttercream? While there is slightly more to it than just creaming butter and powdered sugar together, the payoff is huge! You’ll definitely find that it’s worth that little bit of extra effort. And once you get the hang of it, it will seem like second nature! That said, there are a few pitfalls you should look out for. I’ll break them down below, and let you know how to deal. Why is my Swiss Meringue Buttercream grainy? 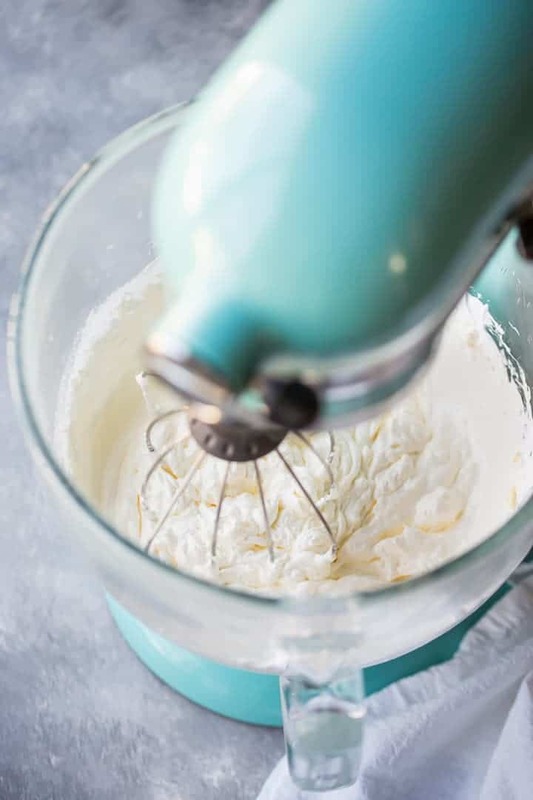 When making Swiss meringue buttercream, the first step is to melt sugar and egg whites together over a pot of steamy water. When the sugar is completely dissolved, you get that incredibly silky-smooth texture in your final product. But if you don’t heat the mixture long enough, you might feel gritty sugar crystals between your teeth. I usually cook my whites/sugar for around 10 minutes, whisking occasionally. You’ll notice the mixture goes from thick and transparent, to thinner and more opaque. But the best way to know if it’s really ready is to place a drop on your finger, and rub it together with your thumb. If you feel any grit at all- keep cooking. When it’s smooth as can be, you’re ready for the next step. You’ll also notice that the mixture feels hot to the touch. You can gauge with a candy thermometer (it should register 140 degrees F), but I don’t really find that to be necessary. If it feels hot and the sugar is fully dissolved, you should be good to go. Why does my Swiss Meringue Buttercream look curdled? Believe it or not, you are doing it right! Swiss meringue buttercream almost always goes through a stage where it looks curdled, broken, or split. This often happens just before it fully comes together! Just be sure to add the butter in slowly (just a tablespoon at a time), and let each addition become fully incorporated before adding the next. Just keep on whipping, and I promise, it will come back together! Why is my Swiss Meringue Buttercream runny? Temperature is everything when making this recipe. The whites and sugar need to get hot enough to dissolve the sugar, but then they need to cool down a lot before the butter goes in. It’s easy to get impatient at this stage! I’ve done it plenty of times myself, and ended up with a runny mess. But you do not have to pitch it! It’s totally salvage-able. Just put the entire thing (mixing bowl, whisk, and runny buttercream) into the fridge for about 20 minutes and then re-whip. It works like magic! It’s also a good idea to pay attention to the temperature of your butter. You want it softened, but it should still be somewhat cool to the touch. You don’t want it so slippery and nearly melted! I have found that if I soften my butter in the microwave (while still wrapped in sticks) for 10 seconds at 30% power, then flip it over and do another 8 seconds at 30% power, it comes out perfect! Just bear in mind that all microwaves are not exactly the same, so you might have to experiment a little to find that perfect sweet spot. Can I make Swiss Meringue Buttercream ahead? I often make it the night before I need it, and let it sit out at room temperature. This is fine to do if you plan to use it early the following day. If you’d like to get even more ahead of schedule, it can be refrigerated for up to a week. But you may find that it comes out a bit hard, and loses some of it’s airy lightness. Just scoop it out of the container and re-whip it (after it’s come back to room temp). It will be just like new! It can be frozen as well, just thaw overnight in the fridge and then follow the method above. Is Swiss Meringue Buttercream stable? I honestly think it’s about the most stable buttercream out there. It works really well for piping, and it holds up beautifully. It is mostly butter, so on really hot days you may have some trouble, but the egg whites do a lot to help it hold its shape. If you want to serve it on a very hot day, just keep your cake or cupcakes refrigerated until ready to serve. It also works very well under fondant! It gives you a perfectly smooth surface with no lumps or bumps, so it’s ideal. When I worked as a pastry chef, it was all we used for fondant-topped cakes. Does Swiss Meringue Buttercream crust over? Swiss meringue buttercream will not crust, like American-style buttercream does. This makes it really easy to work with, especially if you’re trying to get a perfectly smooth finish on your cakes. How can I color and/or flavor Swiss Meringue Buttercream? Swiss meringue buttercream is super versatile! It can be colored with gel paste food coloring (aka: icing colors), and flavored in TONS of different ways. 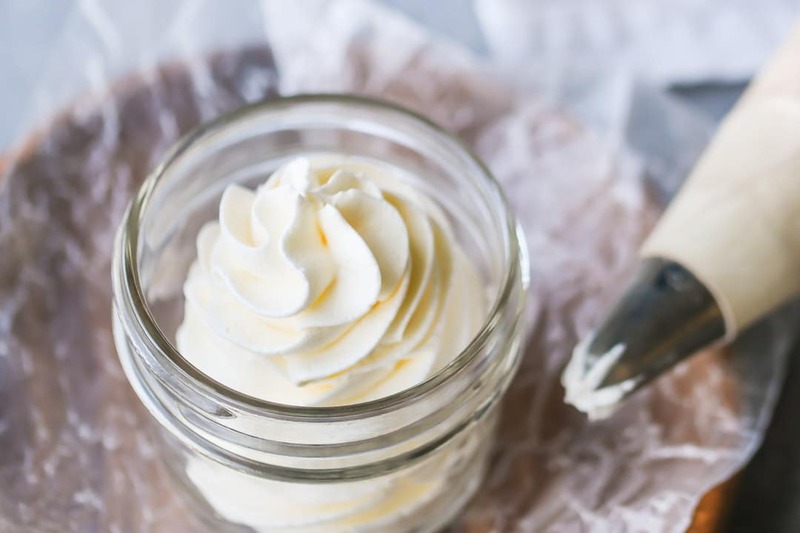 Fold in the seeds of a vanilla bean, 1 1/2 teaspoons of vanilla bean paste, or 2 teaspoons of vanilla extract to make Vanilla Swiss Meringue Buttercream. Add melted chocolate to make Chocolate Swiss Meringue Buttercream. Add melted white chocolate to make White Chocolate Swiss Meringue Buttercream. Place freeze-dried strawberries in the food processor, grind them to a fine powder, and stir them in to make Strawberry Swiss Meringue Buttercream. Whip in the zest and juice of a lemon, lime, or orange for a citrus Swiss Meringue Buttercream. Stir a tablespoon of instant espresso powder together with 3 tablespoons of hot water, and stir the cooled mixture in to make Coffee Swiss Meringue Buttercream. Puree a couple of cups of raspberries, then cook them down until thickened and stir in to to make Raspberry Swiss Meringue Buttercream. Reduce sparkling wine to a thick syrup and add it in to make Champagne Swiss Meringue Buttercream. These are just a few ideas! You’re really only limited by your own imagination. Just be careful not to add a whole lot of liquid, or your buttercream could separate. Find more great frosting recipes on my “Icings, Frostings, Fillings, & Toppings” Pinterest board! 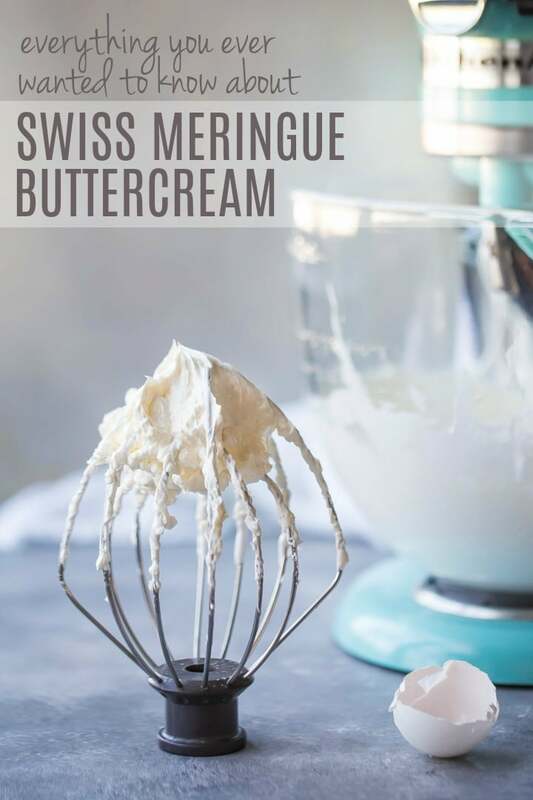 Find out everything you've ever wanted to know about Swiss meringue buttercream: from how it's made and stored, to what to use it for, and how to flavor it in all sorts of ways. 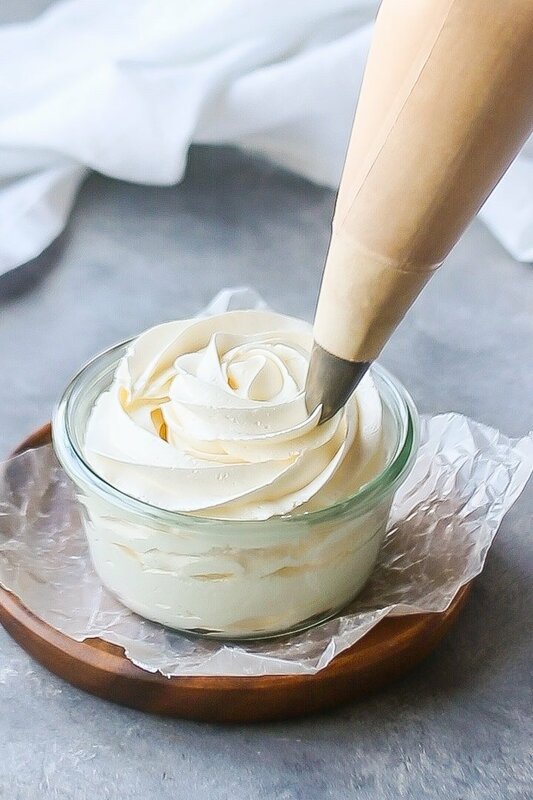 You'll love this light, silky frosting so much, you'll never go back to powdered sugar again! 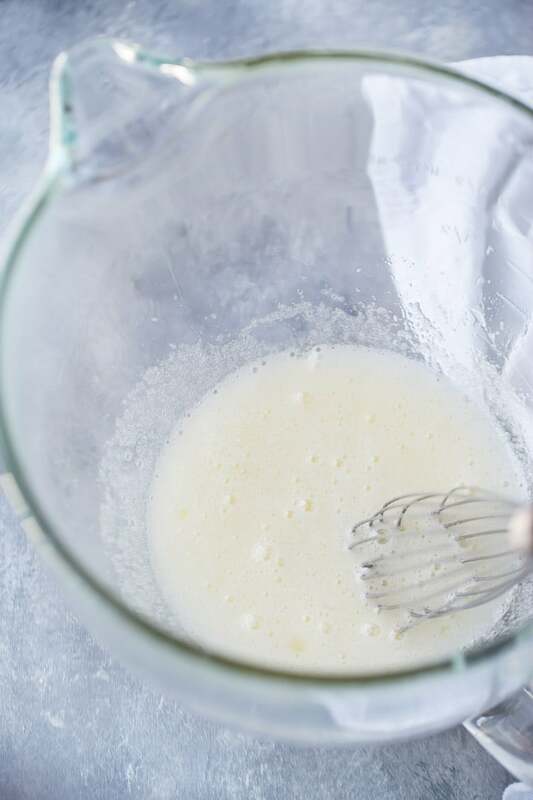 In a large glass or metal bowl, combine the egg whites and sugar. Fold in the salt and any other flavorings you may be using. This recipe makes enough to fill and frost 1 triple-layer 6-inch layer cake, 1 double-layer 8-inch layer cake, or 2 dozen cupcakes. Would using super fine sugar make it easier to dissolve or does it not make a difference? It might, but just remember that you probably want to still cook the eggs until hot, just for safety’s sake. Hope that’s helpful! Thanks Mariana! I have not tried that myself, but I did search around online a bit and it’s not really recommended because of the higher water content of margarine. I hope that’s helpful! Thanks so much for reading. Thanks for the confirmation Allie. I’ve been experimenting with SMBC and margarine because my husband is allergic to dairy. I’ve had a lot of trouble with it. Sometimes it works. Others it doesn’t. Regardless it is much softer than cow butter so that makes decorating difficult. You should try substituting the butter for crisco and adding butter flavouring! Great tutorial and recipe. I’m a big fan of Swiss Meringue Buttercream, but now I always go for Italian Meringue Buttercream since I don’t have to stand over the oven whisking for 10 minutes. Would you say that there both equally stable? Beside the method, are there any differences between the two? Hi David! The main difference is that with Swiss you don’t have to make a hot sugar syrup. I prefer it for that reason, hot sugar scares me lol! And you don’t have to whisk it constantly, I just whisk occasionally, to prevent the eggs from scrambling. I would say they are both equally stable, so definitely stick with whichever you like best. Thanks for reading! I can think of so many uses for this! Hey Christine! There is info on this within the post, under the heading “Can I make Swiss meringue buttercream ahead.” In a nutshell, it should be fine, but if you have concerns just be sure to cook the egg whites until they top the 140 degree mark. So glad you like it Linda! And thank you so much for sharing! Can we add cream cheese to the swiss meringue buttercream? Hi Maria! You can but it may result in a less stable frosting. Cream cheese has a higher water content than butter so it can make things a bit runnier. Good luck! Hi Maria, to add cream cheese you need to have equal quantities of cream cheese to Vanilla Swiss Meringue buttercream. First you whip the cream cheese, then slowly add the same amount of Swiss Meringue buttercream in small amounts till beaten in. Never use more cream cheese than buttercream. This is stable enough for filling, but not frosting or piping. Once you make it you will love it! It’s heavenly! Aloha from Kaua’i! I have a question, WHEN do I add in the flavorings, after the buttercream is completely mixed? Oh and another question, can I treat matcha like espresso as far as ratio of powder to hot water? Mahalo! I have never tried to make this before but it sounds amazing! How many cupcakes would you say this recipe will frost? It makes 6 cups of frosting so you should be able to do at least 2 dozen, if not more. Hope you enjoy! What kind of chocolate to make chocolate frosting. Can you use cocoa powder? Hi there! There is a link to the recipe within the post. Here it is again, in case you missed it: https://bakingamoment.com/simply-perfect-chocolate-swiss-meringue-buttercream/. Do you have any experience making this frosting in advance? I’d like to make it Friday night (double batch), pull it out of the fridge Saturday morning, give it a few turns in the KitchenAid to whip, and then pipe on my pre-baked cupcakes. Would the icing hold up well in the fridge overnight? This topic is covered within the post. Please see the heading “Can I make Swiss Meringue Buttercream ahead?” Thanks! I have loved using your recipe! I usually use it right away, but I have a large cake due on Wednesday this week that I would love to use it on. I think tomorrow i will layer, carve and crumb coat. Then I will need Tuesday to apply the fondant. The event is Wednesday evening. I plan to decorate on Wednesday. I was going to use the pasturized egg whites….will it be ok to leave at room temperature for 48 hours or so? Or should I try to put it in the fridge overnight tomorrow? I’m just worried it won’t fit in the fridge. Lol! Thanks so much!! Hey Aletha! You know, I tend to be pretty relaxed about these kinds of things. I have definitely left Swiss meringue buttercream at room temperature for 48 hours and not had a problem. That said, I do think that cakes and frostings generally hold up better when kept cool. They just seem to hold their shape better, in my opinion. I’d say, if you can manage to make room in your fridge for it, you’ll probably have a sturdier cake. Hope that’s helpful! I’m making this today for a friends birthday! I tasted the meringue before I stuck it in the fridge to cool off. It’s not super duper sweet. I haven’t added the butter yet, but it’s not nearly as sweet as buttercream frosting I’ve made in the past. I’m starting to feel paranoid that I only put one cup of sugar in the meringue. Is this a mildly sweet frosting? If it’s suppose to be really sweet, you think I could salvage it after adding the butter by adding some powdered sugar and maybe a little milk? Hey Drew! This kind of frosting is not going to be as sweet as an American-style buttercream. It’s got more of a subtle flavor and a much silkier mouthfeel. I would not advise adding powdered sugar or milk. I hope that’s helpful! Happy birthday to your friend! Hi , I would like to know how to color Swiss meringue if only liquid food colors is available . Does it work ? Thanks . Hi Fatima! It works but the color will not be quite as vibrant and you will have to use a lot more. It will do that if you add too much. You might want to invest in a little jar of gel paste! They only cost a little over a dollar and they last a long time. I came across Swiss Meringue Buttercream searching for a frosting that used less sugar. It seems like I’m going to have to pick either sugar or fat. Why does Swiss Meringue Buttercream have so much butter? What would happen if I only used half? I’ve done it and it’s still very tasty! It won’t be quite as stiff and pipe-able but it still works and tastes delicious. At what point do you add the pinch of salt? Sorry if you already said but I didn’t see it mentioned in the article or recipe. It can go in at the very end, along with any other flavorings you choose to use. Thanks Jen! Hi Aadils! A large egg white weighs about 34 grams. If you prefer to bake by weight, you might want to download my free weight conversion chart. There’s a link in the right sidebar. Hope that’s helpful! Made this today and the frosting is a bit watery, I can’t imagine frosting a cake with it. Would putting it in the fridge thicken it up a bit? Yes definitely! Read the whole post there’s lots of info there as to what to do if the frosting seems runny. I made this today and unfortunately I didn’t whip the egg whites and sugar long enough (even though I thought it wasn’t grainy in between my fingers). Is there anyway to correct this mistake or am I doomed to eat grainy frosting? Thanks! I’m so sorry Brandy! I don’t know if there is a way to correct it once the butter has been added. The sugar needs heat to melt it, but the butter can’t handle that heat without melting. I’m so sorry you’re having trouble Akira. Just to reiterate: the Swiss meringue needs to be completely cool before the butter goes in, otherwise the butter will melt and you’ll have a soupy mess on your hands. If you don’t get it cool enough before the butter goes in, all is not lost. You can chill the mixture in the fridge and re-whip. As long as it’s cooled down enough for the butter to re-solidify, it will come together, but you do have to re-whip it. You can’t just put it in the fridge and be done with it, it needs to re-whip. I hope that’s helpful! I want to make a cookie cake and was wondering if I could use SMB for piping between the 2 layers and on top? Would I have to keep it chilled until just before serving? Hey Lydia! Could you tell me a little bit more about the cake you want to make? Are you talking about a cookie cake like this one: Chocolate Chip Cookie Cake? I’m not used to seeing cookie cakes like that that are more than 1 layer. I just want to make sure I give you good advice! I’m concerned that the frosting wouldn’t hold up under the weight of a large, heavy cookie. Hi, just wondering how long can you store this icing if you make to much? It’s sooo yummy! Hey Lachlan! Check out the info within the post, under the heading “Can I make Swiss Meringue Buttercream ahead?” I think you’ll find all your answers there. Thanks for reading! Easy to follow instructions. I made it yesterday. It seemed airy. But I went to frost cupcakes this evening and it reminds me more of eating softened sweetened butter… Not meringue-y at all. Any thoughts what I’m doing wrong ? I actually made a similar recipe a year ago and had the same results … I literally could have just buttered the cake because that’s what the texture was. Hey Ellen! I’m sorry to hear that the buttercream was not to your taste. I don’t think you’ve done anything wrong. It sounds like you just don’t have a preference for this type of buttercream. You might want to try American-style buttercream instead. Here is the recipe for vanilla: Vanilla Frosting, and here is the chocolate version: Chocolate Frosting. Hopefully you’ll like these recipes better! Hi Nirvana! If it’s more than a day or so then I would say yes. Enjoy! Could you please advise how many grams three sticks of butter refers too? Hey Eve! 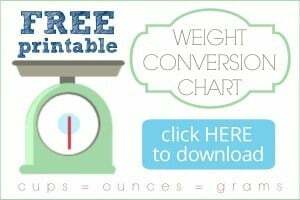 You are welcome to download my weight conversion chart, it’s totally free and you can find it in the right sidebar of this site. Thanks so much and good luck! Hi! Thanks for the detailed tutorial! Two questions: 1) Can you please update the white chocolate swiss meringue buttercream recipe? The link is broken! and 2) Can you use pasteurized egg whites that come in a carton in place of fresh egg whites? TIA! Hey Monika! So sorry about that- and thanks for pointing it out. I’ve updated the post but here is the recipe you were looking for: https://bakingamoment.com/cranberry-white-chocolate-cupcakes/. And yes, you can use egg whites from a carton. I’ve done it many times and it works well! Hi, I’m a long time lover of Swiss and Italian meringue buttercreams. That said I’m wanting to make a maple flavored one for a cake tomorrow and am wondering if I can substitute the maple syrup for sugar? Have you tried this? It seems like adding at the end would make it too unstable and not give me the deep maple flavor. And I really don’t want to waste a cup or two of precious maple syrup! What do you think? TIA! That’s an interesting idea! I honestly have not tried that but it sounds delicious. 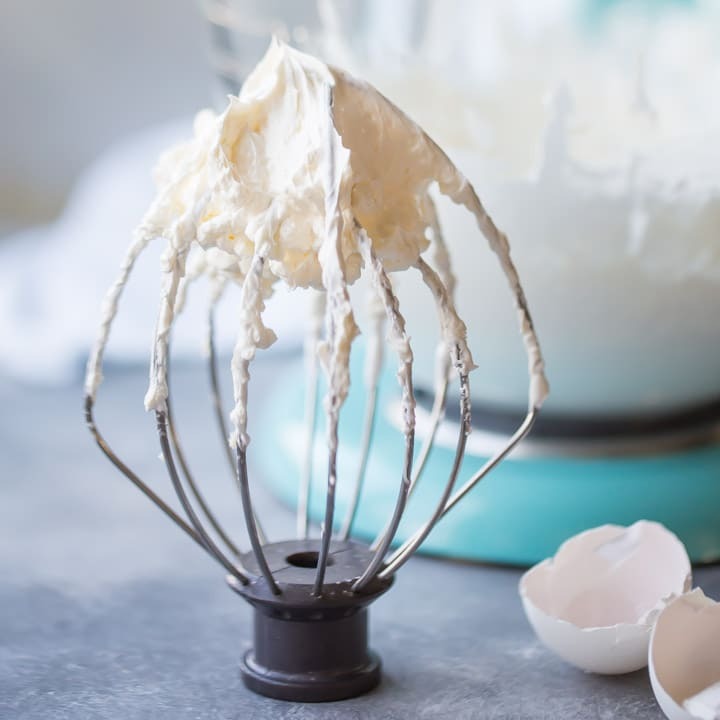 I can say that in my experience you can’t really add more than a few tablespoons of any kind of liquid to the finished buttercream, without it starting to separate. I would love to hear how you make out with this! Hi, I’ve never made swiss meringue buttercream, but I want to give it a try and I was thinking of making a cookies and cream flavored one but I’m not sure how I could achieve that. Do you think it will remain stable if I add the cream from the cookies and some cookie crumbs? Or can I flavor it anotother way, thank you this post was super helpfull!! That should be no problem Lauren! If I were you, I’d just crush up the cookies finely and fold them into the finished buttercream. Good luck and enjoy! Hi Aisha! This recipe makes enough to fill and frost 1 triple-layer 6-inch layer cake, 1 double-layer 8-inch layer cake, or 2 dozen cupcakes. Good luck and enjoy! I’ve been running into some issues with making swiss meringue buttercream and I was wondering if maybe you would know the culprit behind it? 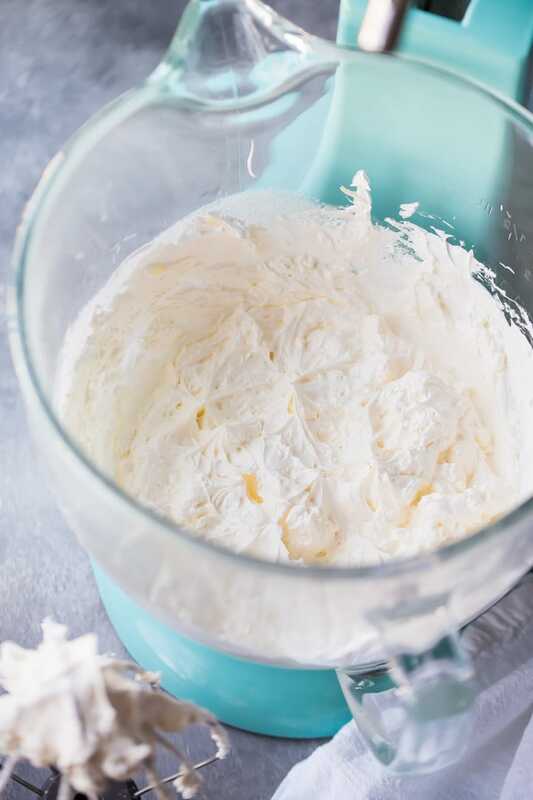 I heat up the sugar and egg whites mixture until 155 degrees F and whip the mixture with a stand mixture until cool and stiff peaks form–but the whole process takes me over an hour! I’ve seen lots of people say that it should only take around 10-15 minutes to whip up glossy peaks but my meringue mixture at the 10 minute mark is just shiny and soupy. I love the texture and taste of swiss meringue buttercream but this hour plus process drives me nuts and I’m on the verge of giving it all up. Hi Iris! My best suggestion would be to make sure your bowl and whip are immaculately clean and grease free. And be really careful when separating your eggs. 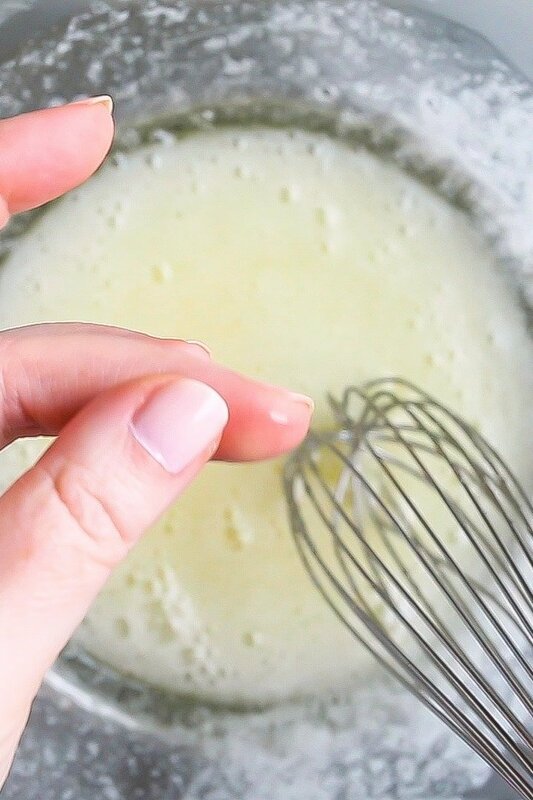 Even the tiniest drop of egg yolk in the whites mixture will prevent your meringue from whipping up properly. Fat is the enemy when it comes to whipping egg whites! Hopefully that advice is helpful! You may also benefit from popping the bowl in the fridge for a few minutes to help it cool down faster. I find that it takes FOREVER to make a SMBC on a hot day, but cool days are a lot faster! I only use this recipe for my buttercream needs. Love it so much. The first time I felt it let alone tasted it I was hooked and I personally don’t like frosting but this is the exception! I would like to double this recipe and add peanut butter. I would appreciate your help in knowing how much peanut butter I should add. Thank you so very much! I am so with you Kimberly! This is my absolute favorite, for taste and for texture. If you’d like to make a peanut butter version, please check out this recipe: https://bakingamoment.com/snickers-cupcakes/. will i get the same results if i use an electric hand mixer? Hey Keren! You should. 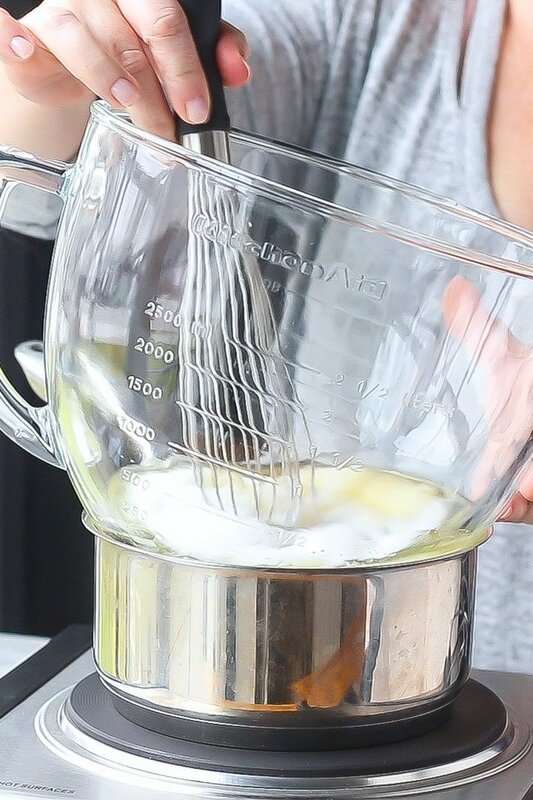 I would say use a whisk attachment if you have one, and get ready to work out those biceps because you’ll be mixing for a long time! Good luck! So glad it worked out for you Terri! Thanks for the positive feedback! Hi! Does the crumb coat (using the swiss meringue) harden enough for the decorative coat? Hi Donna! This buttercream does not crust over like a powdered sugar buttercream would. You would have to refrigerate it if you want it to harden. It does get quite hard in the fridge. Hope that’s helpful! Congratulations to you and your son Tammy! Have fun practicing! This came together really well. It became quite worrisome after adding the first half of the butter as the mixture became quite floppy and limp. Slowly but surely with the addition of the second cup of butter and more beating it came together and became light and fluffy once again. Thanks for the note on curdling. I would consider beating the butter before adding it to the meringue, I feel it may make a smoother finish. Thank you so much for your recipe and videos. I made it the first time last week and the consistency and taste was perfect. The only thing I noticed was that it smelled very eggy. My husband even asked me why it smells funny. Any ideas what I did wrong? Hi Ann! You want to put them on before baking the meringues. They will not melt! They are meant to be baked. Good luck and enjoy! I’m so sorry Ann there must have been a glitch. That comment was meant for another reader who was commenting on a baked meringues recipe. I’m not sure why it went to you! I’m looking at your question now… you were asking about your frosting smelling eggy? I’m not sure but the only explanation I can think of is that the recipe does contain egg whites, so that is probably where the smell is coming from. I’m glad you were happy with the taste and consistency! Thanks so much for reading I apologize again for the mixup! where is the quick video mentioned in right above the recipe ? I can’t see a video. If you are viewing on mobile, it’s in the recipe card. On desktop, it loads at the top of the post and then scoots to the lower right sidebar as you scroll. Hi, I made this icing for the first time today. It was very smooth and creamy but I thought it tasted too ‘buttery’. Is this the way it’s supposed to be, or did I do something wrong? I don’t think you did anything wrong Ala! It is meant to be buttery for sure. It’s a true buttercream, lots of butter and that flavor really shines. Thanks for the great question! Thank you for sharing your smbc recipe, I tried it for the first time and loved it.. I did do one thing different and beated my butter for 1/2 hour until it had lost its yellowness and then added it to the meringue mix and it worked wonders. Great tip! Thanks so much for sharing that Anne! Hey, Is it possible to overheat the egg and sugar cuz even before adding the butter (i didnt do it yet) it was very runny and i want to know if I should start over again? I mixed for sure for 10 min if not longer … what did i do wrong? also, would i be able to use organic sugar? Organic sugar should not make a difference. What exactly was the problem? I don’t think you’ve said, unless I am missing something? Is it just that the liquid seemed runny? Egg whites are liquid and would be runny before being whipped. Did they not whip up right? If they don’t whip up to stiff peaks then it could be because you got some yolk in there. Even a tiny drop of yolk would prevent a meringue from whipping up properly. Or if your bowl or whisk were greasy that would cause the same issue. If the egg and sugar are overheated then you would have scrambled egg whites. Sorry I can’t be of more help but I need more info from you in order to troubleshoot! Hello thank u so much for the recipe and tips but I do have one question how long can a frosted cake with the Swiss meringue buttercream last in the fridge uncovered? Thank u once again ! Not sure what cake recipe you’ve used, but the frosting should keep well in the fridge for at least a week. Hope that’s helpful! How long will this recipe keep at room temp? I’ve made a similar recipe before and keep it refrigerated, but a cake plate takes up a lot of room in my fridge! Hi Drew! I’ve kept it at room temp for a few days and not had a problem. Hope that’s helpful! Hi! I am making my daughter’s birthday cake and covering it with fondant. If I use this Swiss buttercream to fill the cake does it need to be refrigerated? I’m trying to make the cake 1 to 2 days before the party. Hi Anita! I think you will have much better luck with it if you can find the room in your fridge. It will hold nice and firm for you, and your layers will be less likely to slide apart. Good luck and happy birthday to your daughter! Hi! Thanks so much for the helpful tips! But just can’t seem to get it right. I have tried 5 times now, but I can’t get the sugar to dissolve! I heated it to 160F, whisked frequently, used a spotless bowl, used ultra fine sugar. But it just stays grainy and thus doesn’t whip up. Should I add the sugar in bits? Or what am I doing wrong? Thanks so much in advance! That’s so strange Jael! I can’t imagine why your sugar wouldn’t melt at that high of a temperature. And honestly it should still whip up even if the sugar isn’t dissolved. So sorry you’re having trouble! I am at a loss? Hi, thanks so much for your quick reply! Too bad you don’t have a solution. I’m completely mystified too. I even used a thermometer. When it reaches 160F it’s still grainy. Maybe I’m not doing it long enough? How long should it take? And is it ok if it surpasses the temperature? Thank you! They only thing you want to be careful of is that the egg whites don’t scramble. Really your sugar should dissolve way before you hit 160F. Are you whisking as it heats? Yes I am! Stove at lowest heat, whisking, and the egg never scrambles. It turns into soupy and frothy like some recipes mention, and till a certain degree the mixture feels soft, but I can alsways feel the sugar. When I put it in the stand mixer it doesn’t whip up. Well, a little bit at first but then It just becomes flatter and it’s like the egg and the sugar separate again. So weird. I’m going to try again this week and try and keep whisking all the time. Thanks for the help anyway! So strange! I am going to keep thinking about this and maybe a light bulb will go on for me at some point. If I think of anything I will let you know! Have you ever made Graham Cracker cake and used Swiss Meringue buttercream between the layers and Swiss Meringue Frosting on the top? I’m trying to bake a Graham Cracker cake for my Mother’s 90th birthday. Hi there! I’ve made graham cracker cupcakes but not a whole cake. I think the cupcake recipe would probably work as cake too though. You’d just have to fiddle with the bake time. If you type “S’mores Cupcakes” into the search window at the top, it should come right up for you. Happy birthday to your Mom! I panicked after adding first stick of butter because the icing became very runny. I put in fridge for a few minutes and whipped while adding rest. It worked!! I luv it. So glad you were able to bring it back together! Im a big fan of Swiss Meringue Buttercream on cakes but I have never made it before. Im planning on making this for my mom’s birthday cake and she is not a fan of super sweet frosting. Is it possible to add less sugar than the recipe says? I’m going to use a hand mixer so I’ve heard that it takes a long time, so should I make this a day ahead the day a I want to decorate the cake? Hey Anna! 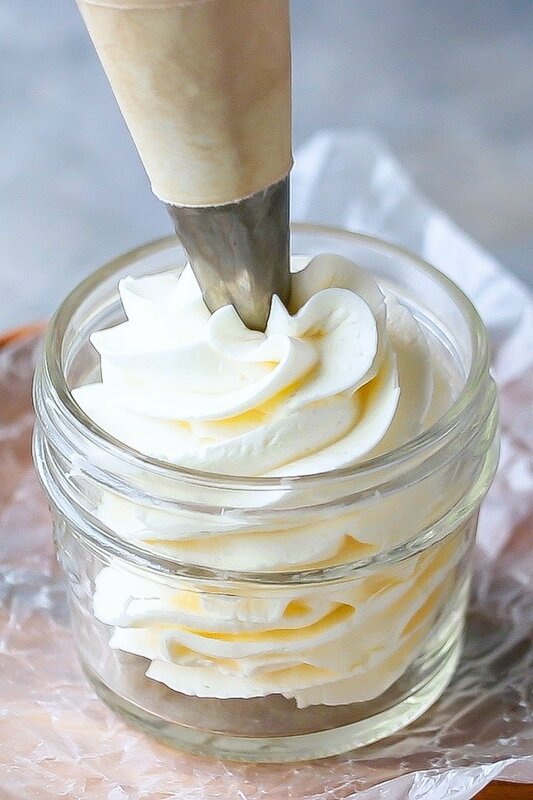 I think this is best when it’s freshly whipped, so if you do make it the day before you might just want to “re-fluff.” And the recipe is already less sweet to begin with, so I’d keep that in mind when deciding whether or not to decrease the sugar. Hope this is helpful! Good luck! Thank you for your very quick reply! I will make it as the recipe is and thank you for advice on the buttercream! My pleasure Jasmin! Hope you enjoy! Thanks so much for the recipe! Its AMAZING! Last time I made it though the meringue was taking AGES to cool down and the meringue started to get really thick (turning in nougat) so I added the butter but the meringue was still too hot so it got soupy and I had to put it in the fridge to pull it back. Would it be okay to pasteurize the eggs with the sugar and let them cool slightly before whipping up? I’m not sure what happened, but my final product tasted like straight whipped butter?!?! I couldn’t use it. Do you have any tips on decorating your cupcakes with the swirl? How do you do that? What size tip, etc. Do you have a how-to video. Mine never come out looking so good! Hey Jennifer! If you check out this post: https://bakingamoment.com/whipped-cream-frosting/, you’ll find some good info there, including a video showing how to pipe the swirl. I think you’ll find it really helpful! Hi, made for the first time recently, but found that when piped it didn’t hold form enough, and when eaten on cupcakes it was like really soft cream that squidged everywhere , certainly wouldn’t have worked between a layer cake or even as a crumb coating. Any idea where it may have gone wrong to be that soft? Could your butter have maybe been too warm? I’m having trouble with decor. I cover my cake with the Swiss buttercream and let it rest overnight in the refrigerator, when I retreat, to be able to paint or spatulate the cake begins to sweat, fills with water droplets and I can not work on top of the first layer. What can I do to change this? It sounds like you have condensation forming on the outside of your cake. Are you working in a very hot environment? Try decorating your cake in an air-conditioned space, and if you still find that the cake is dewy on the outside, gently press a paper towel on the surface to absorb it. I’m not familiar with the style of cake you’re describing, but I can say that this recipe will work with just about any kind of cake decoration that doesn’t require a frosting that will crust over. temperature. It will not freeze. Too high of a sugar level. When The sugar and egg syrup is cool, I beat BUTTER til light and fluffy. The butter is the item better able to take the additional ingredients and create a stabile emulsion. After, I add half the syrup and beat til incorporated, then add remaining plus vanilla. It is firm at this point! I always wondered why everyone would destroy the lovely meringue by adding butter? Being newish, I don’t know what adding cookie butter will do to it. My son loves loves cookie butter and I want to make frosting tonight. . Do you or anyone else make SMBC with the method I use? Have you added semi fluid type ingredients like cookie butter or peanut butter to final SMBC? Any suggestions would be great! Thank you! That’s an interesting method; no I’ve never tried it that way. And I haven’t added cookie butter either, although I have done it with peanut butter and it works beautifully. I believe the recipe is linked above.